A tool designed to store your passwords on a web server. Thanks to encryption, these passwords are stored securely. Maybe you have ever been away from home or work where you use a special program to store passwords? When you need it, it turns out that you didn't take the file with you? This program will be available on the Internet at a special address that only you will know. Thanks to this you can log in to your account and then take your password to any system, e-mail, CMS. This software uses aes-256-cbc encryption, which is the safest at the time of application development. You will be able to define an unlimited number of categories, for each category an unlimited number of subcategories. The categories and subcategories will contain the page title, user, password, URL and notes that you have saved. The account will be encrypted, it will be possible to change the password along with the change of encryption of all added elements, delete the account, generate your own password from among the different characters. I recommend using the system. But remember one very important thing. In order to ensure security, the server should have an SSL certificate and you should change the password for your collection at least once a month! 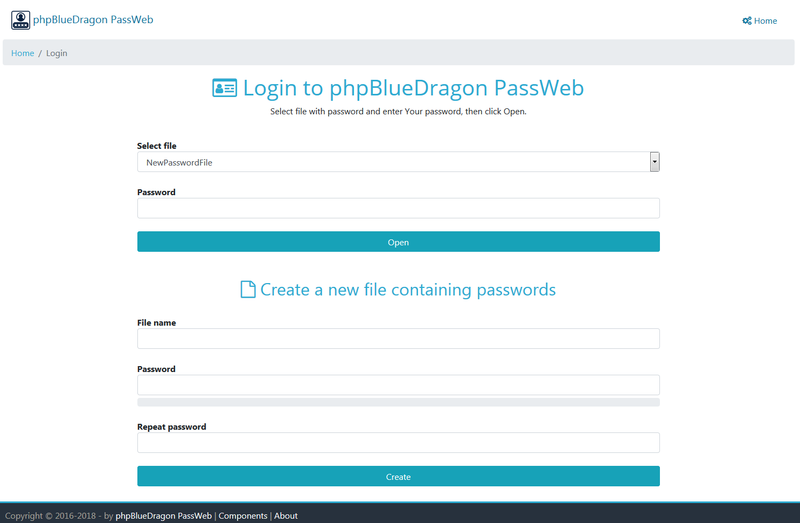 Using phpBlueDragon PassWeb is possible only if the server supports SSL certificates. If you do not have an SSL certificate, your use of the application will be ineffective. Currently, there is a very high probability that someone is taking over packages on the line. This allows all passwords to escape from the software. USE ONLY WITH SSL!